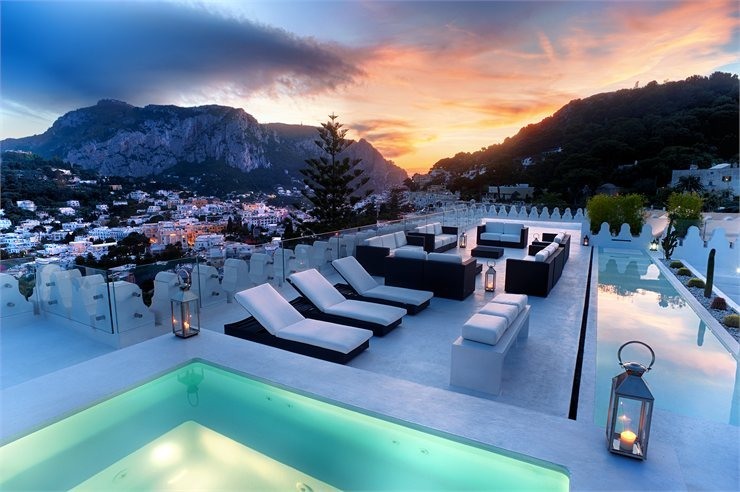 Villa Il Rubino was originally constructed at the end of the 18th century by a well-known family of Capri. 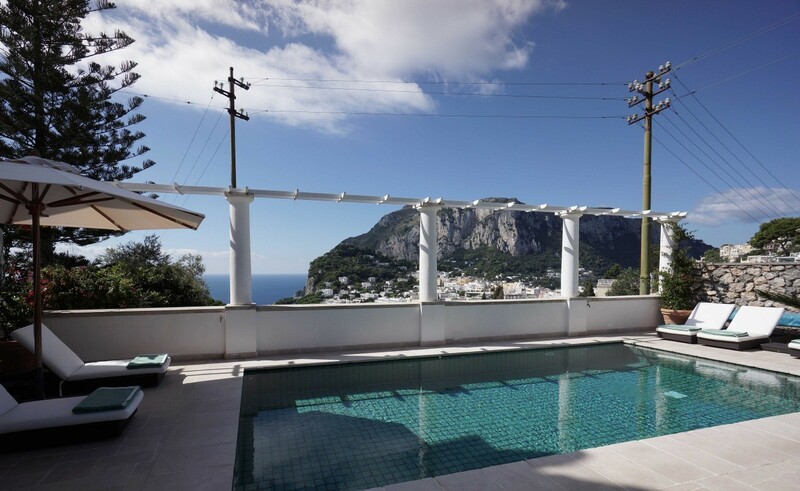 The villa is situated along a walking path overlooking Certosa di San Giacomo and Marina Piccola, with views of the entire town of Capri and Monte Solaro. 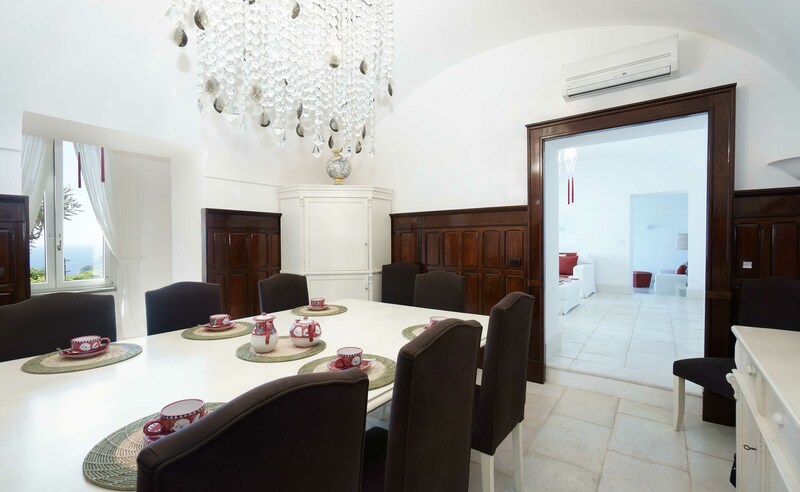 After more than 200 years, the villa is still currently owned by descendants of the original family who recently completed a large-scale renovation in 2010. 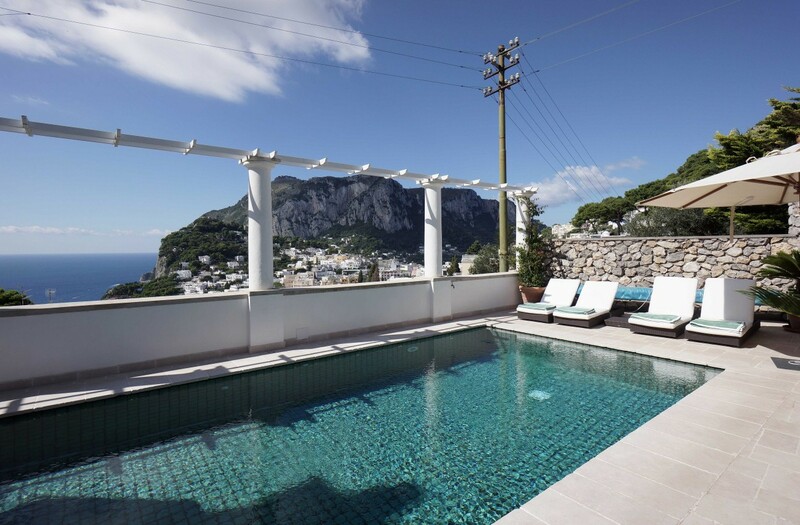 The villa is ideally located in the residential area of Capri and surrounded by superb gardens, just a few minutes from the central shopping district. 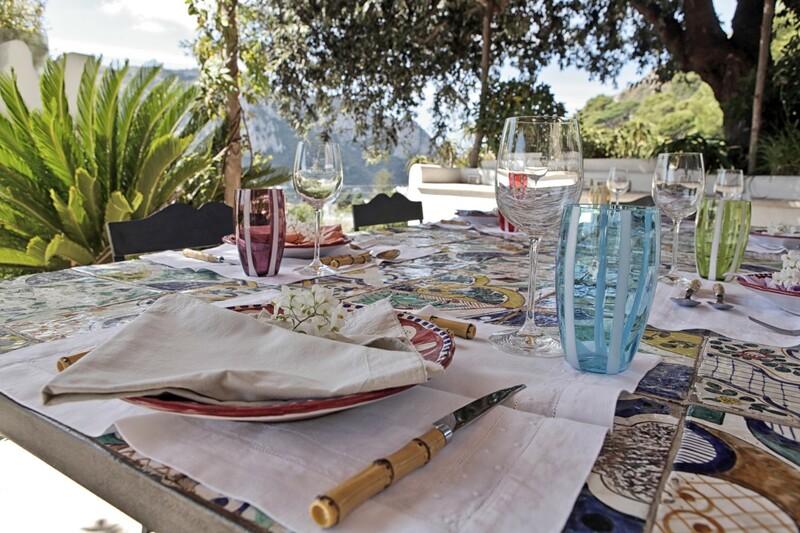 It is the perfect location where you can enjoy a glamorous holiday in the Island. Wi-Fi internet is available on the ground floor, in the bedrooms on the first floor and in the pool area. Telephones have an internal system to communicate between the rooms. Maids: 7/7 working 10/12 hours per day (8.00 am – 8.00 pm) with a break in the afternoon. If you have dinner at home, they will stay until after dinner. Cook: The cook is available daily for lunch or dinner. Buffet breakfast can be arranged upon request by our villa staff. 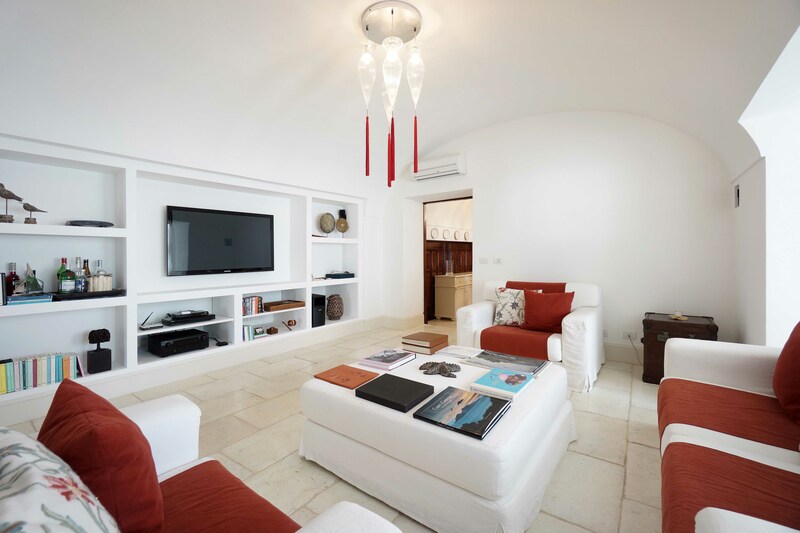 The Villa´s ground floor is comprised of an entrance hall, kitchen, dining room for 12, TV room, and living room. The entrance hall is decorated with crystal lamps and a large majestic Venetian mirror. 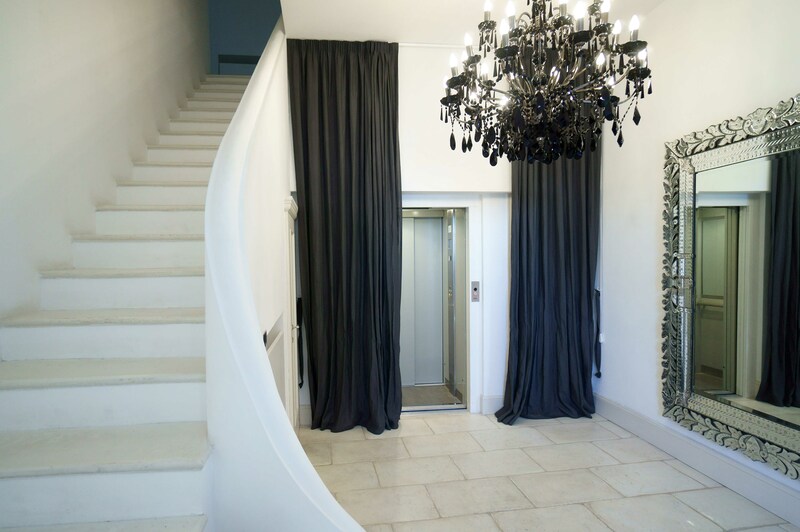 You may use the elevator or climb 20 steps leading up to the first floor. The well-equipped kitchen is complete with all of the modern conveniences and appliances such as an espresso machine, toaster, 6-burner electric stovetop, double oven, dishwasher and refrigerator/freezer. 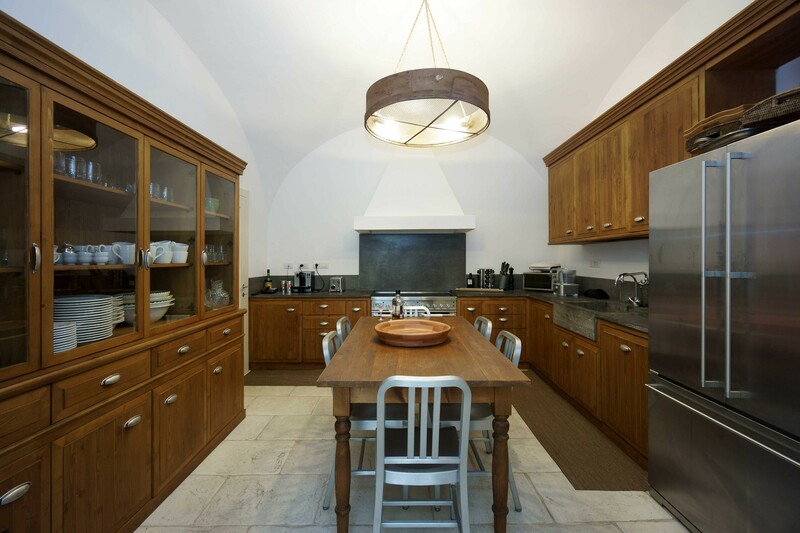 The kitchen is perfect for cooking for yourself, or having the villa’s private chef prepare a meal on-site for you and your guests. The chic indoor dining room is ideal for an afternoon tea or aperitif. The beautiful crystal chandelier hung above the dining table creates an elegant and intimate atmosphere. The game room is equipped with a swivel-top game table. The TV-room boasts a large flat screen TV, an amplifier iPod hook-up, and a collection of DVD’s and CD’s. The living area is furnished with a loveseat and 2 comfortable armchairs. Just off the TV-room lies the formal living room, ideal for reading and relaxing. 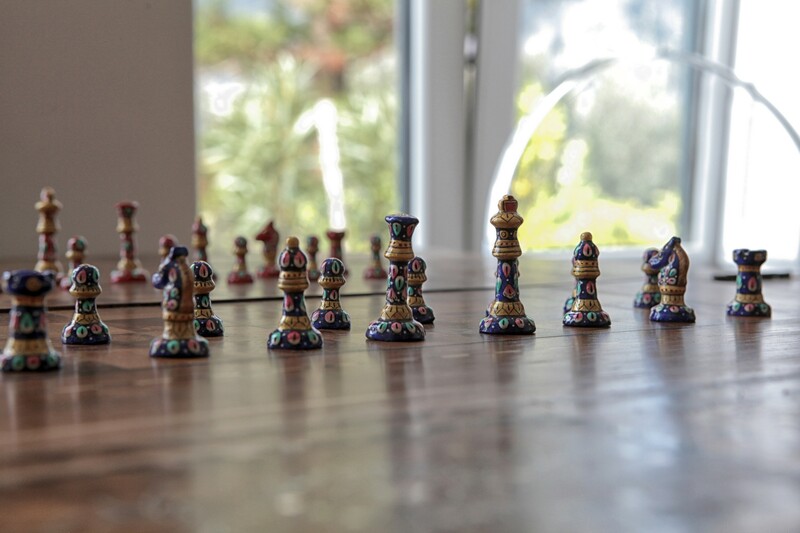 A beautiful painting by the Brazilian artist Vik Muniz is the highlight of the living area. The first floor has six bedrooms, all with vaulted ceilings and private bathrooms. Two bedrooms, including the master bedroom, have full baths with bathtubs and one of the bedrooms has a sitting room, which can be converted into an extra, seventh, bedroom. 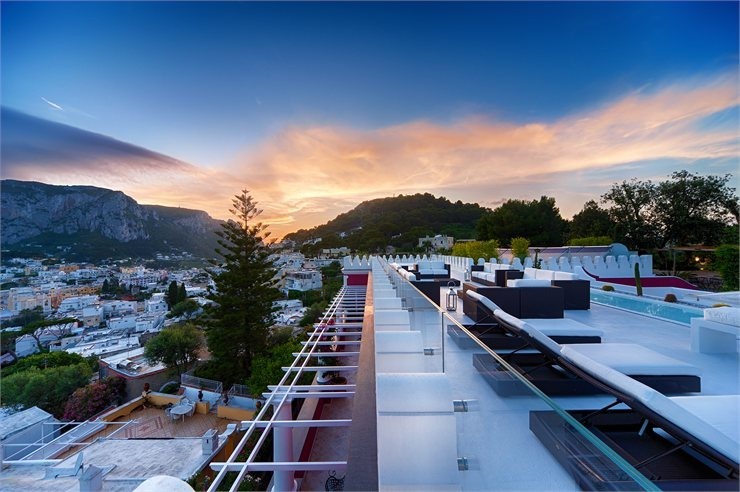 Four of the bedrooms have terraces with views of the sea and the town of Capri. 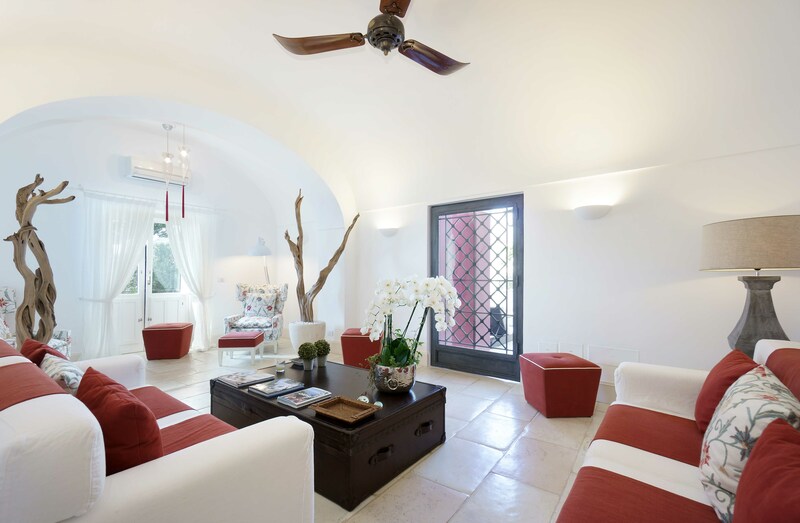 All of the rooms in the house have air-conditioning and Wi-Fi Internet access. 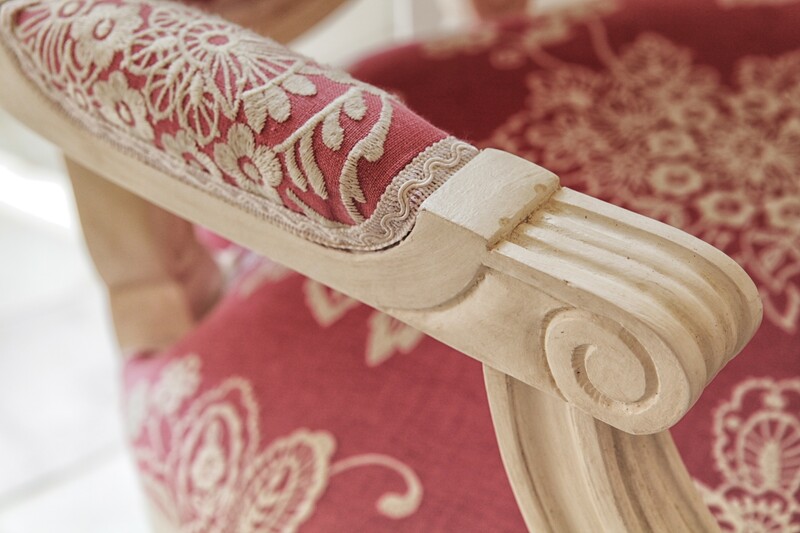 The furniture and linens are all of top quality and the bathrooms all have signature bathrobes and hair dryers. 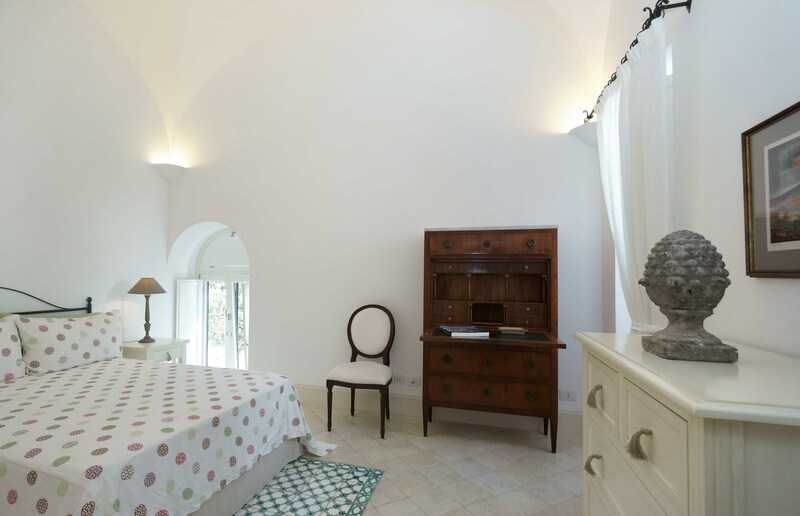 The master bedroom has a baldachin double bed, arm chair, small round table with 2 chairs, wardrobe and dresser. 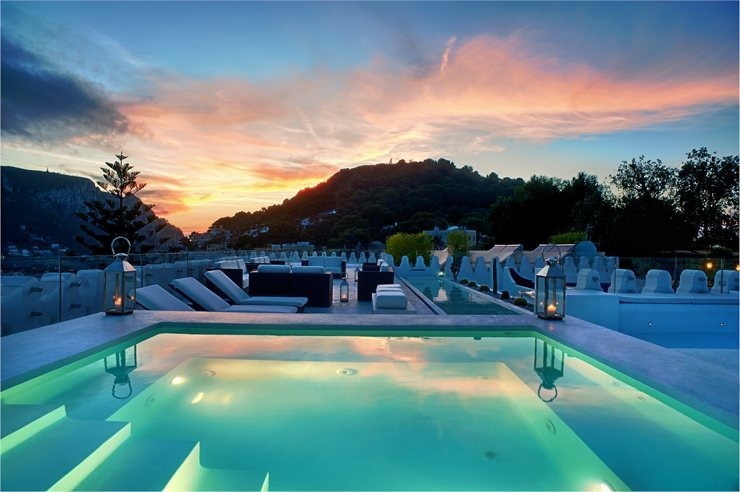 There is a private terrace overlooking the pool area and access to the balcony. 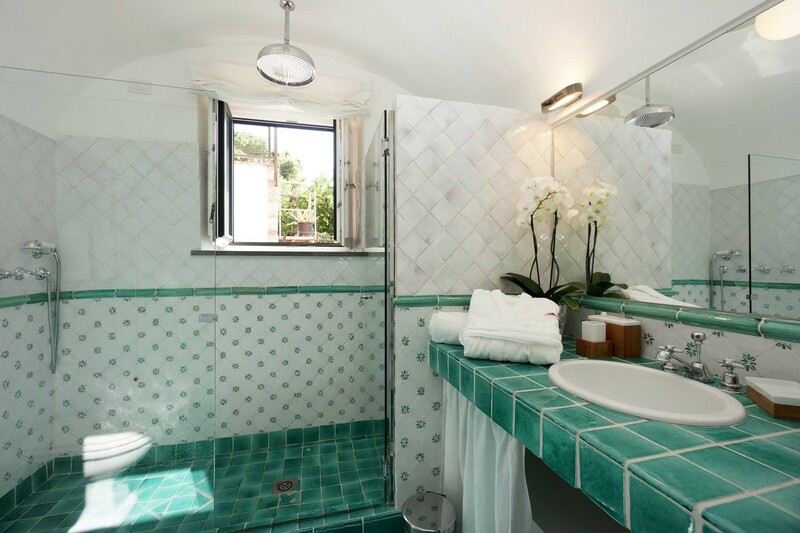 There is a private bath with an oversized tub, large shower box with a glass door, and a double sink. 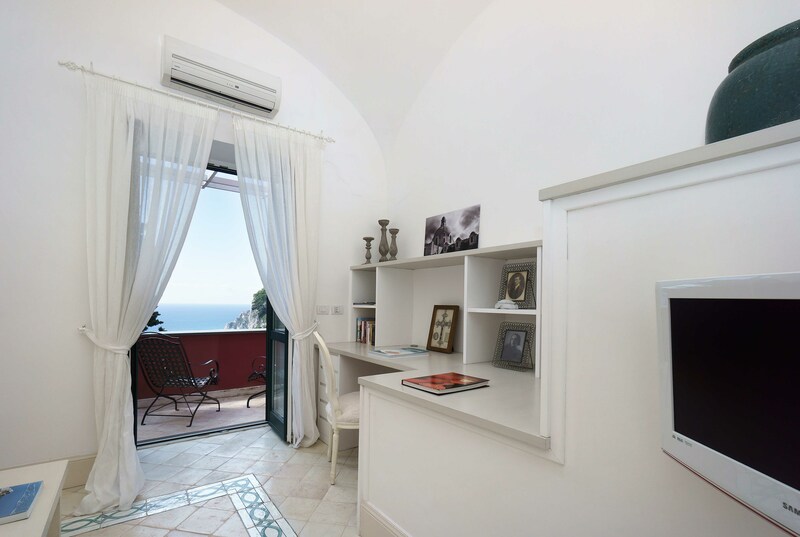 On the opposite side of the hallway there is a double twin bedroom with access to a secondary lateral terrace with views of the green slopes of the Island. 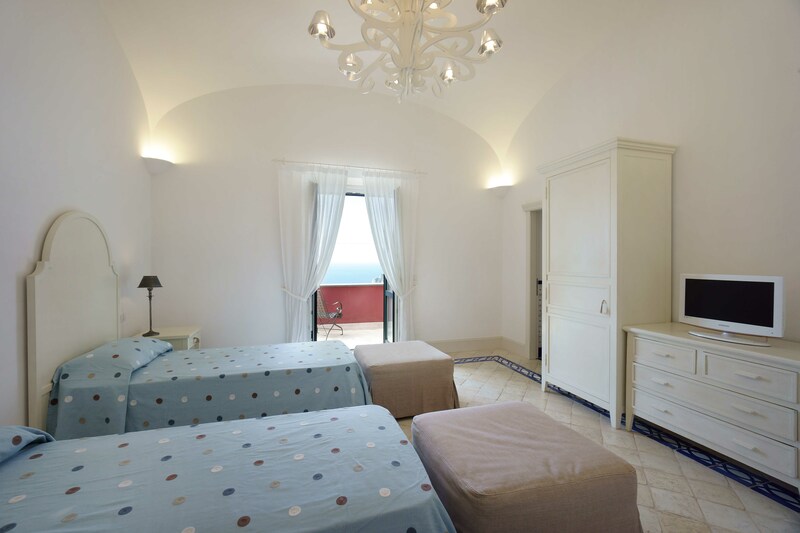 The room is furnished with a sofa, table, 2 wardrobes and a dresser. 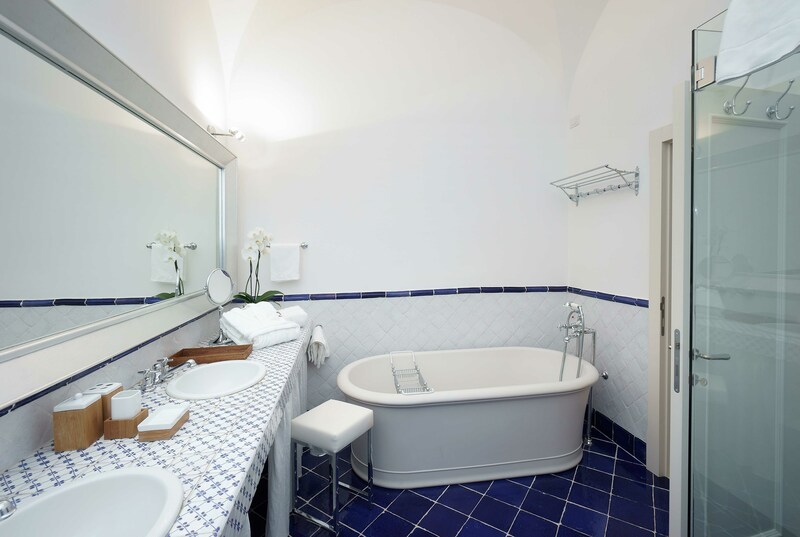 The room includes a private bath with large bathtub and large shower stall, and a double sink. The next double bedroom has direct access to the balcony opening onto the terrace, which runs along the first floor. 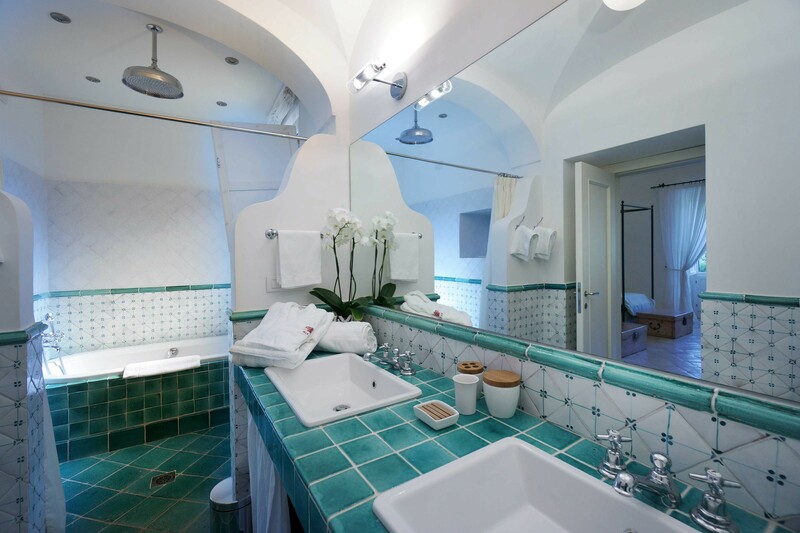 The room includes a wardrobe and dresser, small flat screen TV and a private bath with large glass shower stall. 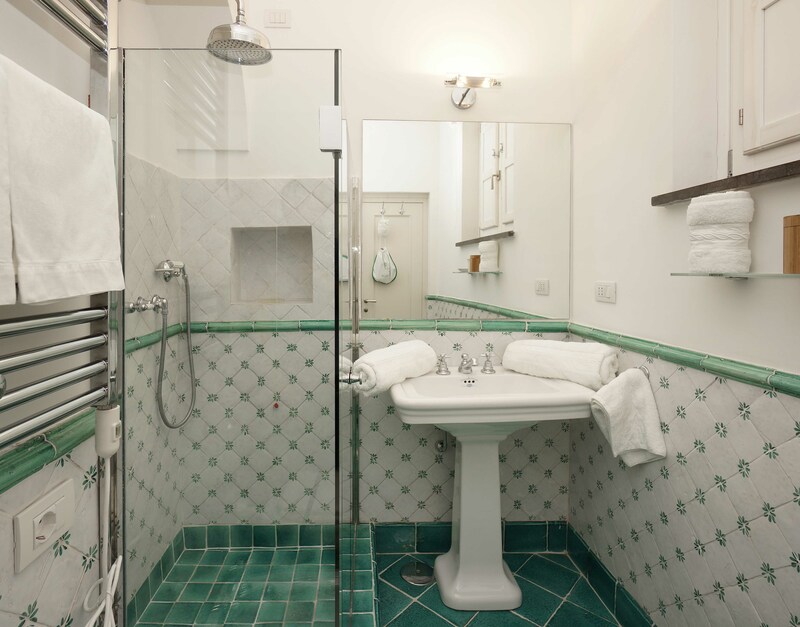 There are two small twin bedrooms, both with en suite bathrooms with shower stalls with glass doors. These two bedrooms have windows providing natural light and provide views of the back of the property. 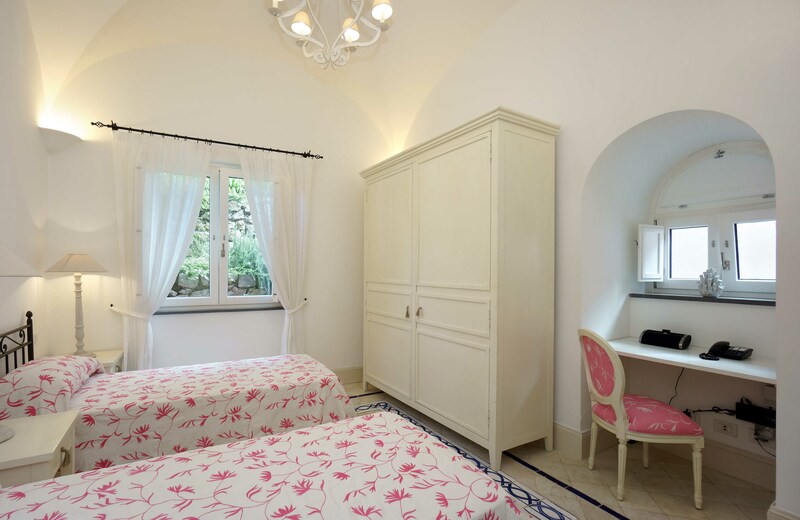 The final bedroom is a small double bedroom with antique pieces of furniture including a desk, wardrobe and dresser. There also is an independent living area with a sofa, a larger writing desk, and small flat screen TV. 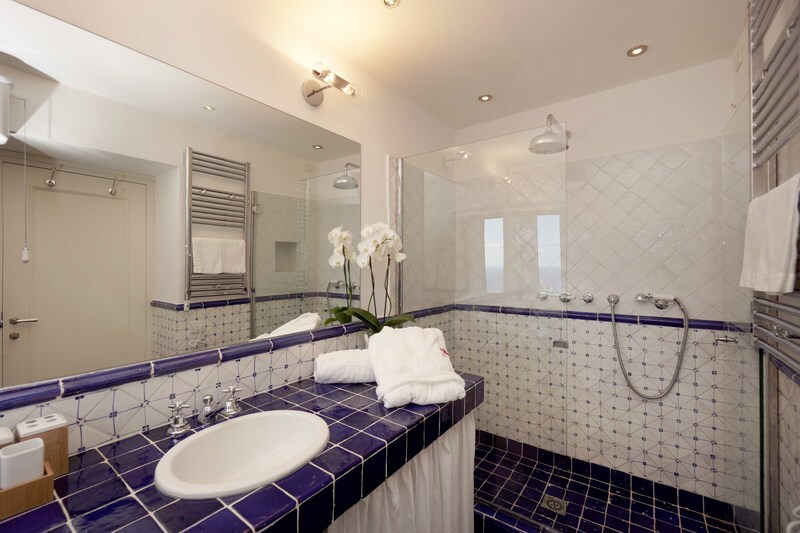 This room has direct access onto the main balcony and a private bathroom with large shower stall. There is also a laundry room with washing machine, dryer and ironing equipment. 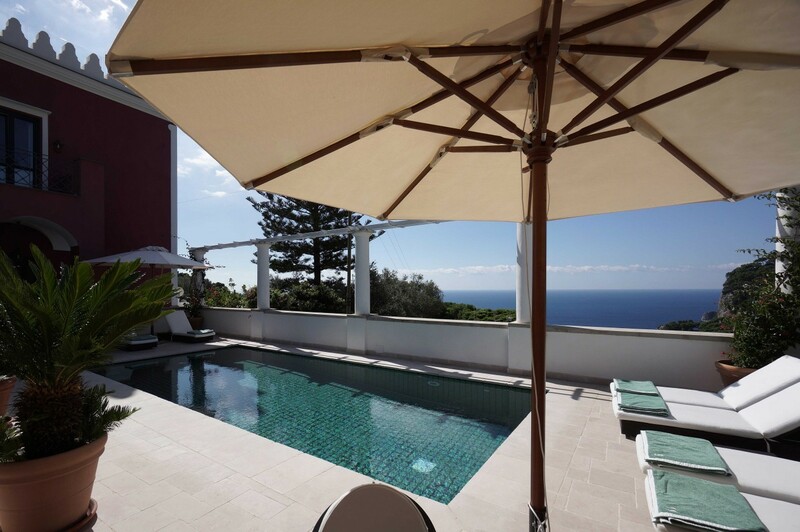 The Villa has a heated 4×7 meter (13×22 foot) swimming pool. There is an outdoor bar with a refrigerator and sink next to the pool, where drinks or lunch can be served. The area is furnished with a small iron table with 4 chairs. 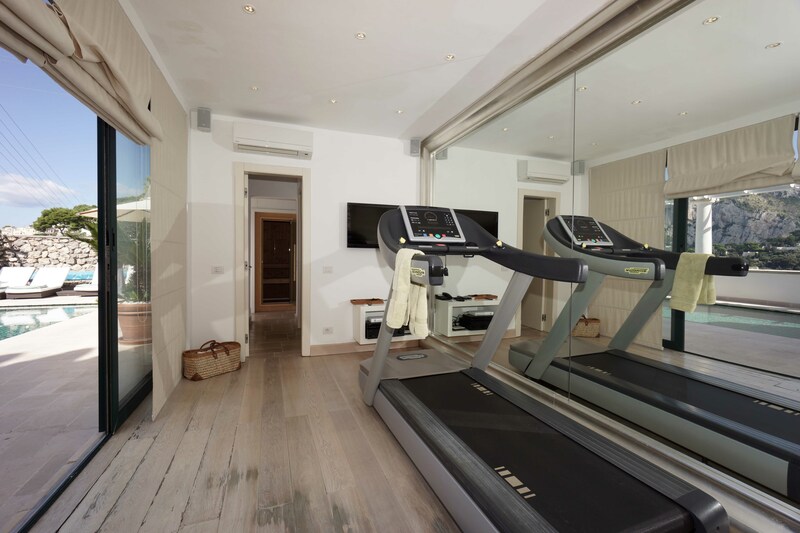 There is an air-conditioned gym with treadmill and stretching bar, complete with an entertainment unit with music, TV, video and DVD. 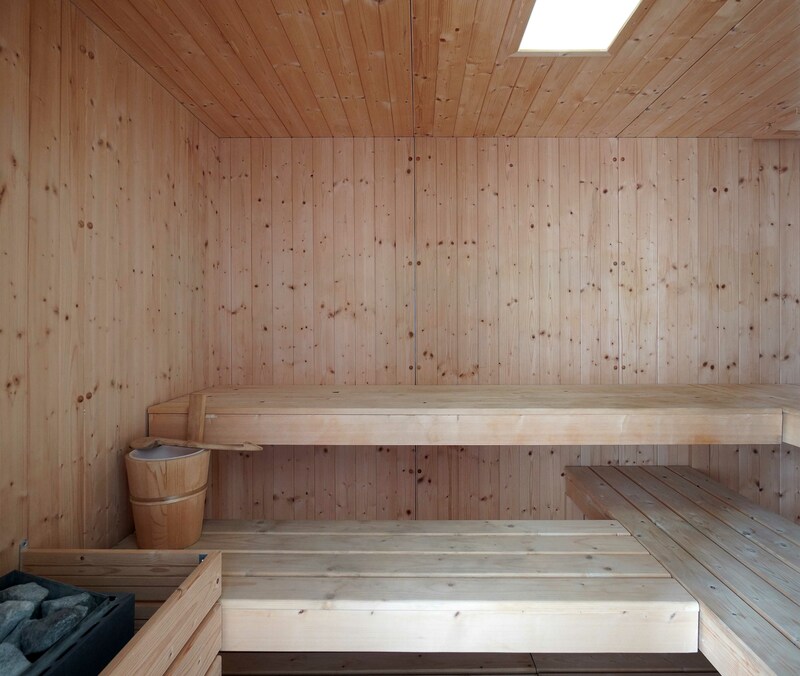 The facilities also include a sauna and shower stall with glass door. There is also a restroom with toilet, wardrobe and changing room. Outside there are 7 lounge chairs with cushions and top-quality pool towels. 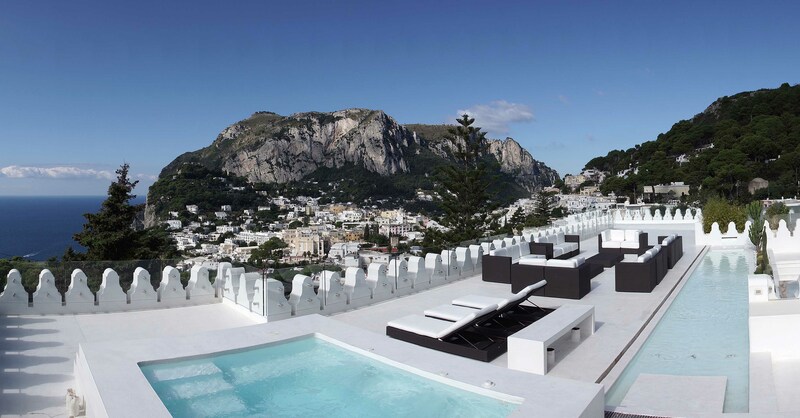 From the pool terrace, a traditional Capri colonnade overlooks the town center of Capri offering a glimpse towards Mount Solaro. 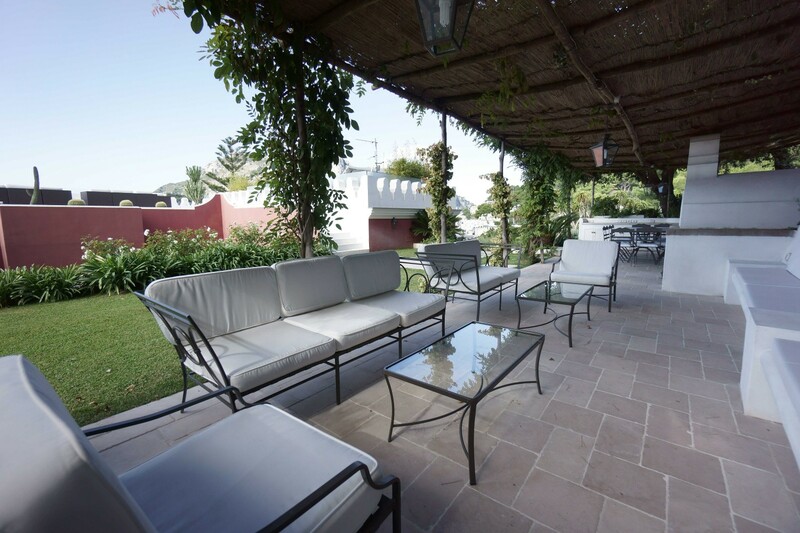 Small potted palm trees line the beautiful paved terrace. 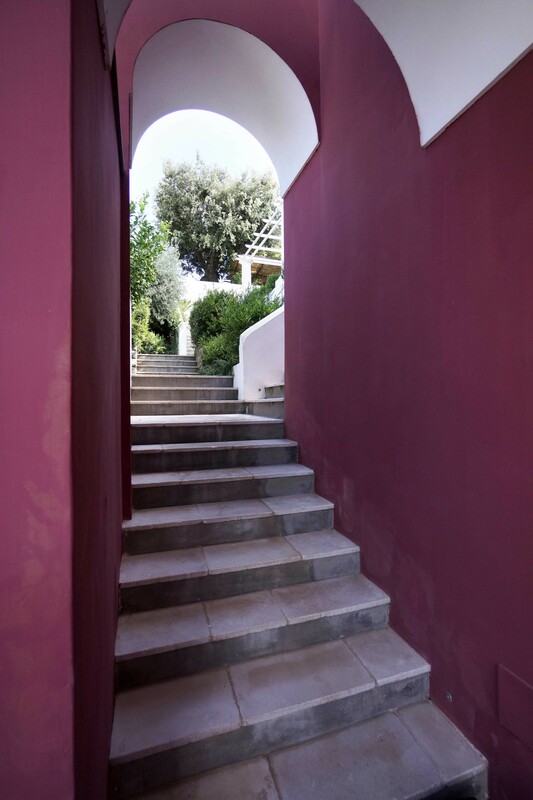 15 steps bring you up to the garden where you can find a shaded dining area with seating for 12 people. 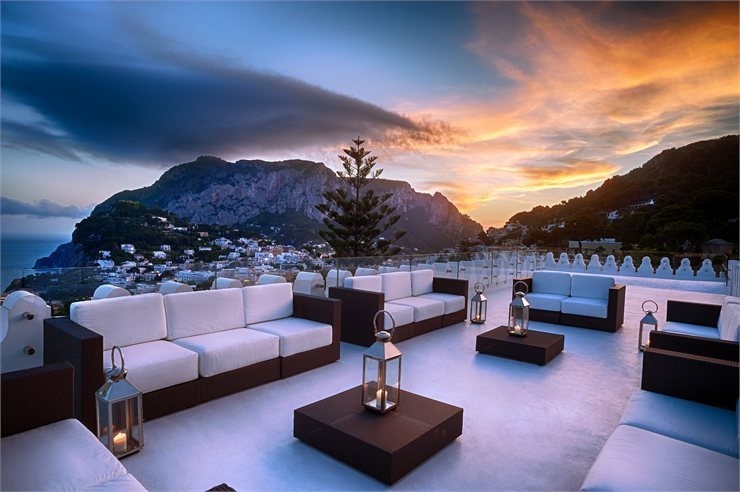 There is a beautiful iron table, topped with colorful antique ceramic tiles, ideal for al fresco dining while enjoying a glimpse of Capri town. 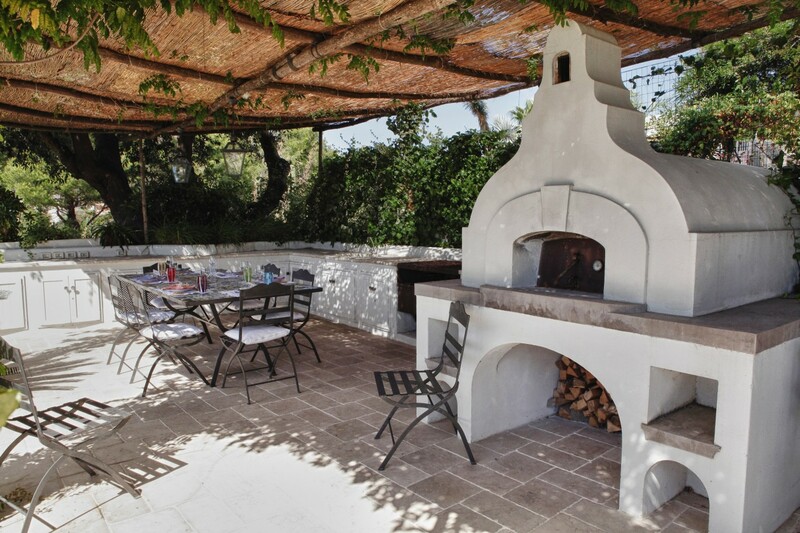 There is an outdoor grill and a classic Caprese-style oven, which can be used for making pizza or roasting meat. There are also built-in benches with cushions, 2 sofas, and chairs with cushions, as well as two small wrought iron and glass tables. 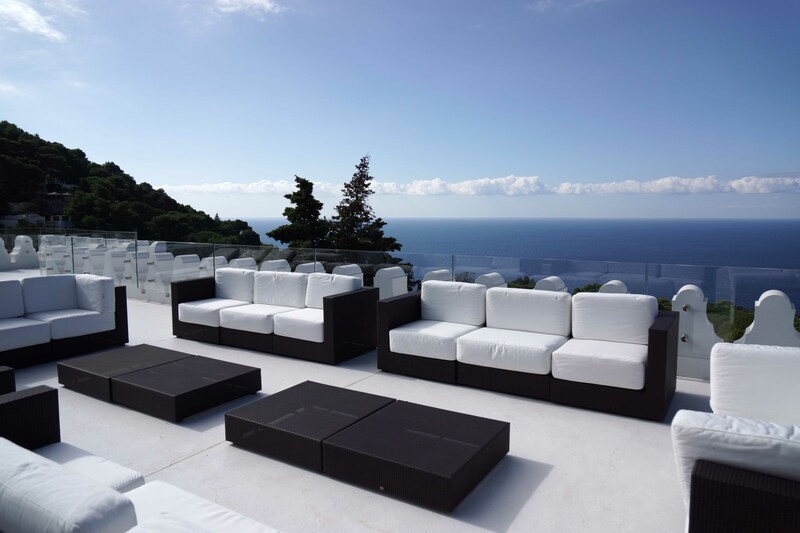 An additional 9 steps bring you up to the rooftop terrace with plenty of seating room including 6 sofas 4 tables. There is also a built-in heated Jacuzzi and an outdoor shower. 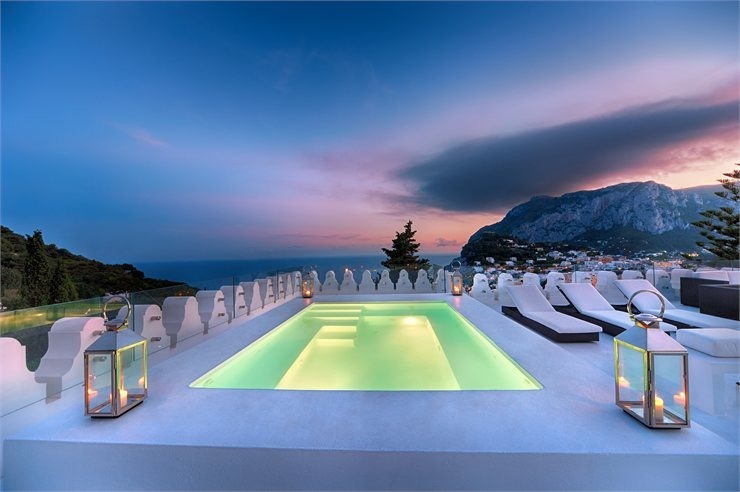 There is also a fire pit and a sitting area, which can be used for sun bathing during the day or for cocktails at sunset, while enjoying a 360 degree panorama of the dreamlike landscape with of views of the sea towards the Bay of Marina Piccola, Capri town center, and the green slopes of Monte Solaro.